Well, except fish, that is. OTTAWA — The country's annual inflation rate slowed to an unexpectedly weak 1.6 per cent last month as the continued decline in food prices played a big role in offsetting the higher cost of gasoline, Statistics Canada said Friday. The agency's latest reading shows the pace of inflation decelerated from February's year-over-year reading of two per cent, which was right on the Bank of Canada's ideal target. A consensus of economists had predicted 1.8 per cent inflation for March, according to Thomson Reuters. Statistics Canada's consumer price index shows some of the biggest downward forces on inflation were lower prices for clothing and footwear, which declined 0.9 per cent, and food, which fell 1.9 per cent. A closer look at the data shows that, compared to a year earlier, the cost of fresh fruit dropped 12.4 per cent while fresh vegetable prices fell 10.2 per cent. 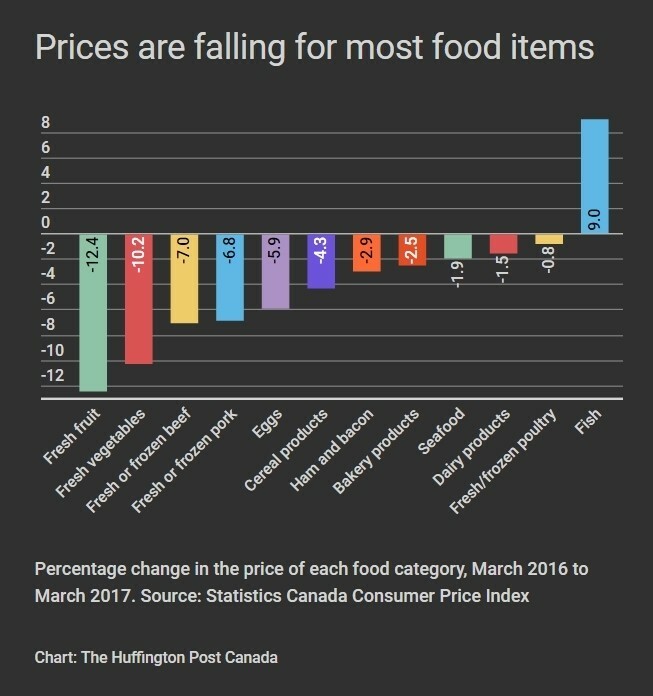 The report says year-over-year food prices fell 1.9 per cent in March — a sixth-straight monthly decline. The agency says higher costs for transportation and shelter made big contributions to the upward pressure on prices. For example, gas prices increased 15.2 per cent last month. The higher prices for travel tours, which rose at a 6.8 per cent rate, were also among the primary contributors to the change in inflation. Excluding food and energy prices, the report said annual inflation was up 1.7 per cent last month, which follows a two per cent increase in February. Across Canada, Prince Edward Island was the only province that saw its annual inflation rate accelerate last month.